If you have trees in your outdoor space, sooner or later you will need to remove dead or dying limbs, and depending on the case, you might even need to remove the whole tree. When that time comes, you’ll be tempted to take matters into your hands, but here’s a more reasonable suggestion – hire tree removal experts! Why? Because there are so many unforeseen things that may go wrong and removing a tree on your own, or just clipping some branches, can be quite dangerous. Tree removal can be a risky task if performed by someone who’s not an expert on the matter. Tree branches can fall in unexpected ways, and this may cause property damage or severely hurt someone. Furthermore, tree branches may appear strong and sturdy but they might be rotten on the inside. So, in case you are tempted to climb on your tree and cut some branches, don’t. Chances are it will break down with you on it and you’ll easily fall on the ground severely injuring yourself. For that very reason, leave this matter in the hands of tree removal experts and stay safe. Here are some of the benefits of doing that. There are several ways to fell a tree and the best way to do it is to leave professionals to decide on the safest method. In this case, weight distribution is crucial, and a professional will know best which branches need to be removed in order for the tree to fall in the desired location. Ropes are also generally used to ensure there are no accidents. 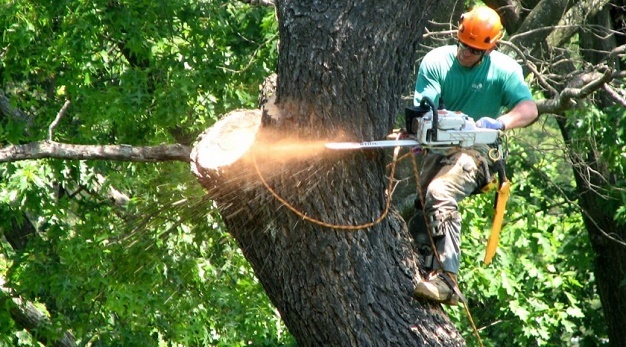 Tree removal experts have the right tools to get the job done safely and effectively. Some of the tools needed for tree removal include chainsaws, handsaws, and ladders, which when managed by inexperienced individuals, may cause serious injuries and accidents. Working near power lines is risky. If the tools you are operating with, or the tree itself, hit a power line, you will not only cut off the power in your entire neighborhood but you might also get electrocuted. Many people think that the black coating on the power lines is insulation, but that’s actually just weather-proofing for the metal cable. You can still get electrocuted through the coating. Again, professionals will take the needed precautions to ensure nothing comes into contact with power lines while working.